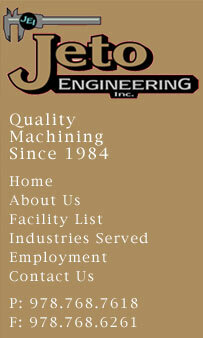 Thank you for your interest in a career at Jeto Engineering. We offer our full-time employees good benefits, a flexible schedule and a simple, government-qualified IRA. We invite you to join our team. We have an opening in our CNC milling department. We are looking for a self-motivated individual with 5+ years experience and the ability to program and setup. You would be required to work with little supervision. We are currently running Fadal and Okuma machines.